Invasions of the Vikings in Ireland started in around 795 AD. The Vikings were very badly slated by the chroniclers of the time, the early Irish Church. Many monastic sites of course were badly ransacked by Viking invaders which impacted on how they were perceived. The concept of towns. Before the arrival of the Vikings, there had only been a couple of large large settlements around Ireland. These were not as organised as a structured town would be. One example of such a 'proto-town' was the settlement around the monastic site at Clonmacnoise. But the concept of a town with an organised structure was new. The Vikings brought it here as towns and cities started to develop in Scandinavia. 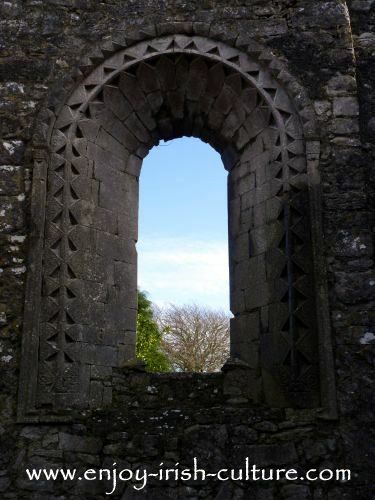 The 12th century window at Annaghdown Cathedral, County Galway is one example for how the presence of the Vikings in Ireland changed Irish design motifs. What is not easily seen in the large picture is revealed in the detail photos below. A snake curls around the entire window frame with the head on the bottom left and it's tail at the bottom right. 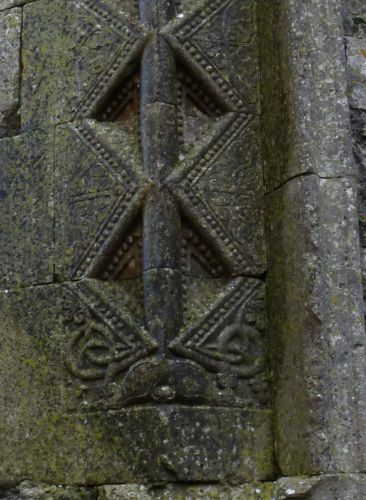 This type of design was unheard of before the arrival of the Vikings. 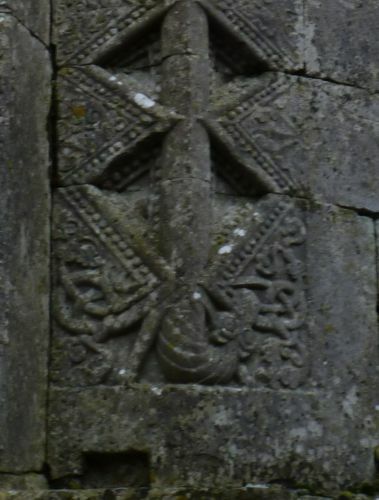 Details of the snake's head and tail as seen on the window of Annaghdown Cathedral. Surviving Viking surnames- examples are: Loughlin and all its derivations such as O’Loughlin, MacLoughlin and so on, Harold (a Viking name), Doyle (an English derivative of Ó Dubhgaill which means the son of the dark foreigner), MacManus (son of Magnus), Cotter, and some others. The Vikings refreshed design motives. They actually, believe it or not, revived some Celtic motives, that were on the verge of dying out at the time because Irish craftspeople conformed to European design standards. The Vikings introduced rabbits to Ireland. Because rabbits breed with high frequency, they were an ideal source of meat for the Vikings when travelling to Ireland in their longships. The Vikings are long gone or have blended in, but the rabbits are here to stay. They introduced new words into the Irish language, for example nautical terms directly imported from old-Norse. Find out how the Vikings arrived in Ireland first, how they settled, and about Dublin as a Viking town. Vikings expanded Irelands’ trading links. Ireland started to trade with other places where the Vikings had a strong presence, such as Turkey. Large scale slave trade. For what it’s worth. In the Viking era, Dublin became Europe’s foremost slave trading port! Coinage. There were no actual coins in Ireland before the Viking era. The Viking coins were made from silver, and have frequently been found bent. They used to test the silver for quality, if it bent it was good. We hope you got a lot from this article on the Vikings in Ireland. We love researching these Irish history topics for you. We'd appreciate a small gesture of paying it back- if you wouldn't mind using the social functions we provide on this website (top left and bottom of page) to let the world know we exist! It will only take a few seconds of your time.